City Council Ordinance 12-0159 known as the Local Hiring Bill has invoked criticism and caused nothing less than controversy since its introduction to the city council in November of 2012. The ordinance is now on its third reading and in June the council will take its final vote. Sponsored by President Bernard C. Young and championed by Councilwoman for the 14th District, Mary Pat Clarke, the law would require “employers benefited by City contracts and subsidies to take measures to hire Baltimore City residents.” It targets contracts worth at least 300 thousand dollars and government subsidies of at least 5 million dollars. The “measures” to which the ordinance refers include posting new jobs to MOED [Mayor’s Office of Employment Development] seven days before advertising publicly as well as filing monthly reports that highlight the number of employees needed, new jobs created and listed, new hires, and other statistics to keep the employer accountable to the mandatory 51 percent. The Baltimore Sun, the Baltimore Business Journal, the Greater Baltimore Committee, and even the City’s legal department have criticized this ordinance; calling it unconstitutional. Marta Mossburg, Columnist for The Baltimore Sun and The Frederick News-Post, is concerned not only with the constitutionality of the ordinance but also with its punitive measures. 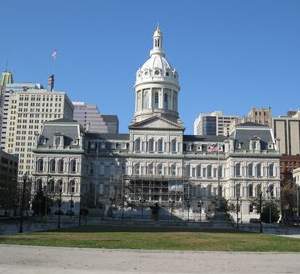 Complex issues like education, job preparedness, poverty, and health all factor into the city’s unemployment rate of 9.4 percent (the report for April 2013 according to Maryland’s Department of Labor, Licensing, and Regulation) but this ordinance will address none of these issues. Mossburg asserts that “top-down” approaches like the Local Hiring Bill do not benefit the city’s economy and this move will only cement Baltimore’s reputation as “anti-business.” Cory McCray, a labor activist and co-founder of the B.E.S.T. Democratic Club, is in favor of the ordinance. He believes that if this ordinance becomes a law, it will inspire those in need of work to learn necessary skills; skills that will also qualify these individuals for those jobs posted by employers. On Monday June 3, the city council unanimously approved ordinance 12-0159, the Local Hiring bill. According to Mayor Rawlings-Blake’s spokesman, the ordinance will become law without the signature of the mayor and will take effect six months from now.